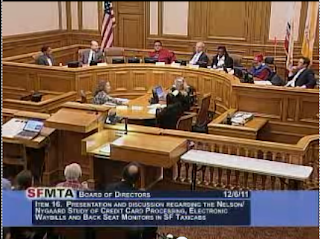 SF Taxi Media: Recap Of MTA Board Of Directors Meeting Held Tuesday, December 6th, 2011. By John Han. Recap Of MTA Board Of Directors Meeting Held Tuesday, December 6th, 2011. By John Han. The MTA Board of Directors, (Municipal Transportation Agency), revisited 5% credit card fees, rear seat passenger information monitors (PIMs), and electronic waybills at its Tuesday, December 6th, 2011 regular meeting. This was item #16 on the agenda and was for discussion only. In it, Nelson Nygaard presented its report on the three topics. The Board also voted 4-2 in favor of item #17, which includes expanding the Medallion Sales Pilot Program, by dropping the sellers' age requirement from 70 years old to 65. Now, medallion holders who are at least 65 years old instead of 70, and have a full-time driving requirement, or who have acquired a disability and are unable to drive, can now be eligible to sell their medallions under the pilot program. According to MTA Deputy Director of Taxi Services Christiane Hayashi, there are currently about 135 medallion holders between the ages of 65 and 70 in San Francisco. But that number includes both Pre K and Prop K holders combined. And since Item #17, which passed, temporarily eliminates Pre K holders from being qualified as sellers, it's uncertain how many new sellers that would mean. But it would be less than 135. Hayashi added that out of the pool of those newly eligible sellers, there's no guarantee that all would likely want to sell their medallions right away. “The medallion represents a monthly financial benefit that some people don't want to lose.”, she said. On Item #16: The Nelson/Nygaard Study of Credit Card Processing, Electronic Waybills and Back Seat Monitors in San Francisco Taxicabs. Nolan also shared that he enjoyed the back seat monitor when he rode in a taxi, including the map feature. Bridges also said she enjoyed very much her experiences with the back seat monitors. Ramos added that he knows that many business owners, including artists, are using alternatives like Square, and that it is safe and secure. He said he's offended by claims made by some that Square poses a threat to personal security. The Nelson Nygaard report can be viewed in full HERE. Also, a legal representative from Square disputed parts of the Nelson Nygaard report that says that some passengers may be uncomfortable using credit cards on a driver's personal smart phone, rather than cab company equipment. The legal rep said that Square is PCI compliant, and is a member of the PCI Security Standards Council. As stated before, the Board also voted 4-2 in favor of item #17, which includes expanding the Medallion Sales Pilot Program, by dropping the sellers' age requirement from 70 years old to 65. The aye votes were – Tom Nolan, Malcolm Heinicke, Leona Bridges, and Joel Ramos. The no votes were Bruce Oka and Jerry Lee. President of the Board Ed Reiskin and Director Cheryl Brinkman were absent. In other words, Pre K holders are only excluded from selling under the current Medallion Sales Pilot Program, which is expected to end in early 2012. Once the pilot program is over, a permanent medallion sales program is expected to begin, the details of which have not yet been fully determined. CLICK HERE to read Ed Healy's take on Item #17 at the Phantom Cab Driver Phites Back. I smell smoke around here, it is it just a skunk in the woods? In my opinion, the Board made some pretty decent moves. Obviously, it's not a complete overhaul of the industry structure like we might possibly need. It may have not gone as far as I personally would have liked. But it demonstrated that it listens to every stakeholders concerns and there have been demonstrable responses. The agency says it's going to look into ways to lower the credit card fees below 5%... maybe 2.5%-3% if possible. It will look into ways to give drivers control over audio from back seat PIMs, or disable audio completely.... and improve controls to dim the brightness of the monitors. Well yes indeed, if I was down to my last pair of under pants, I suppose it could be worse I might not have any under pants at all. Wake up people. 500 cabs are coming its time to occupy Yellow and Luxor. That is what I meant by smoke or a possible skunk. 500 more cabs is quite a few more cabs. All of this is malarkey. This credit card business is just to add the imprimatur of the City to add credit card charges to the driver. This is BS and someone needs to wake up and smell the feces. You cannot charge the agent credit card fees. Drivers are agents of the company. Even medallion holders who assign their medallion to the company, which is common at Yellow, may be considered employee/agents of the cab company. At least that is an argument for the courts to decide. The courts have already decided that drivers are employees and you cannot charge employees credit card fees for transactions with the company the employee for whom the employee works. You cannot charge the employee credit card fees. The rest is all smoke. That the taxi commission board has chosen to ignore these facts speaks of rank corruption. Good for Joel Ramos. I take cabs rather than MUNI becaise I dont want to listen to the idiotic announcements all the time. If I have to listen to even worse crap in a taxi, I'll have to give them up too and just drive my own car everywhere. I sent in an email to the MTA, including the Board, supporting all but Item 7 of the Staff Recommendations. I do not feel it is appropriate for the City to do studies that the businesses should do. I seldom agree with Mr. Heinecke; though I never call him stupid, I do believe he's usually wrong... however I heartily welcome these remarks he made, and I feel they are both very human and admirably diplomatic: "I just feel obliged to note – that if you choose to make ad hominem attacks on our staff, and particularly one person who's working very hard to bring harmony into this industry, it makes us, or at least me, not really value the rest of what you say. If you have an argument on the merits, make it on the merits." Regarding the content of the remark "Once the pilot program is over, a permanent medallion sales program is expected to begin, the details of which have not yet been fully determined," I am sure this is factual, but it is tragic that there has never been a genuine effort to properly evaluate the alleged merits of medallion sales. The idea that a negative evaluation would be found has remained only the remotest possibilty, though any objective committee would have left the possibilty open at all times, in reality, of course, the Taxi Advisory Council is completely biased, and efforts to bring true discourse into the situation have been ruthlessly blocked by advocates of knee-jerk and rapacious capitalism. A job that cannot get you into the middle class is not a job that is worth a quarter of a million dollars. A business deal that takes all your profitability for fifteen years is not a good deal. This is self evident, when approached fromt the point of view of reasoning workers. Only the people who want to own another's right to work are the genuine beneficiaries of such deal. There will always be people insane enough, and/or desperate enough, to seek such deals. But this is not reason enough to ALLOW such deals. As former Taxi Commission member John Barry put it, "If selling work permits is such a boon for all, then why are taxi work permits the only things that fetch a price of $250,000 by the City? If there is an enterprise that pays a $250,000 work permit fee... how many people per day work on that enterprise? 30? 100? more?" This degree of common sense is not apparently available to most of the TAC, or to the SFMTA Board of Directors. And with this observation I return to my customary disagreement with Malcolm Heinecke and most of the TAC and the rest of the SFMTA Board. Does anyone know what city department can be asked about what Verifone information is kept on cabs and the meters in them and for how long and how many different entities hold this information? I believe these meters track a lot more information than just the credit card orders. Amazing to watch the leap of logic from credit card processing solutions to 500 new cabs. Feel like I fell down a rabbit hole . . . while you are all sorting out what is publicly stated and what you privately believe to be true, please paint all the white roses red.